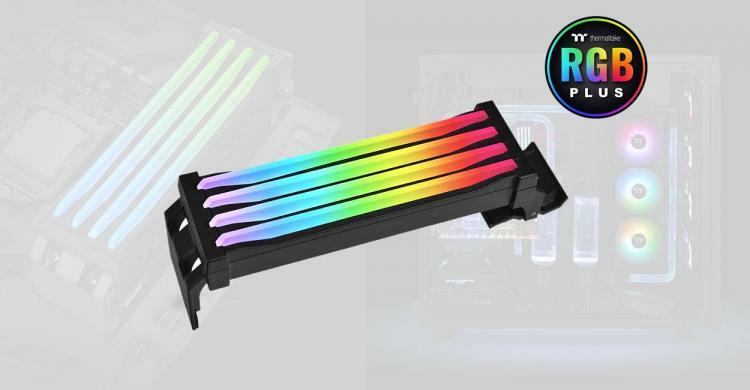 Thermaltake Technology presents the Pacific R1 Plus DDR4 Memory Lighting Kit, an easy solution for non-RGB DIMMs to enable RGB lighting and synchronisation. The RGB memory cover supports motherboards with four DIMM channels and features 36 addressable RGB LEDs with 16.8 million colours. The RGB memory cover can be customised using the patented TT RGB Plus software and supports motherboard-based RGB control applications such as the ASUS Aura Sync, MSI Mystic Light, GIGABYTE RGB Fusion, and ASRock Polychrome RGB Sync. The Pacific R1 Plus DDR4 Memory Lighting Kit doesn’t only support DDR4 memory modules but also DDR3 and DDR2 offering an easy way to add RGB lighting to any DIMM socket. The Thermaltake Pacific R1 Plus DDR4 Memory Lighting Kit uses a straightforward design wherein it simply needs to be clipped on to the DIMM channel bracket and it doesn’t require all four DIMM slots to be populated with memory modules. The Thermaltake Pacific R1 Plus DDR4 Memory Lighting Kit features 36 addressable LEDs, great light coverage, and uniform colour and brightness, R1 can paint your memory module with 16.8 million colours. RGB lighting can be controlled using the patented TT RGB PLUS Software and an exclusively designed mobile app. It is also designed to work and synchronize with ASUS Aura Sync, GIGABYTE RGB Fusion, MSI Mystic Light Sync, and ASRock Polychrome RGB Sync. It supports motherboards that have a 5V addressable RGB header. Using the TT RGB PLUS App, the Thermaltake Pacific R1 Plus DDR4 Memory Lighting Kit supports the Thermaltake AI Voice Control. The kit also works with Amazon Alexa. Built with high-quality components and materials guarantee the durability of Pacific R1 Plus DDR4 Memory Lighting Kit and the RGB LEDs to reach a lifespan of 50,000 hours. The Thermaltake Pacific R1 Plus DDR4 Memory Lighting Kit supports motherboards with 4 DIMM channels. It is compatible with most generations of memory modules on the market, including DDR4, DDR3, and DDR2. Thermaltake Pacific R1 Plus DDR4 Memory Lighting Kit is now available at the TT Premium store with an MSRP of $59.99. Learn more about the Pacific R1 Plus DDR4 Memory Lighting Kit here.